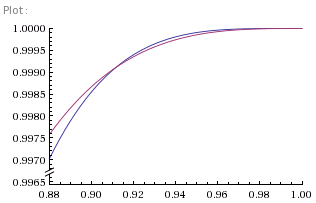 Figure 1 shows a graph of this. It's interesting to see that once your chances of winning each point gets above 80% you're pretty much certain to win the game, and increasing the per-point percentage is pretty much, well, pointless (if you see what I mean). So that's interesting, but hardly surprising. 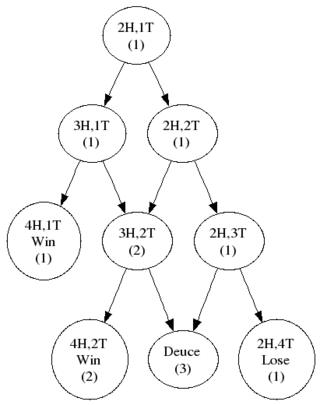 where, as before, D is the probability of winning from Deuce. 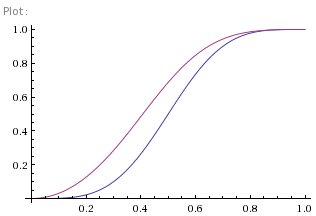 Figure 3 shows this new probability in red, and, as we can see, it has gone up, just as expected. No, but wait! Let's have a closer look at the high percentage portion of the graph. Figure 4 shows a close up view of the section where our chances of winning each point are around 90% or more, and there's something of a surprise. Our chances of winning, even though we're already ahead, have actually gone down. It's hard to be convincing about this without resorting to the equations. However, one intuitive way of thinking about it is this. When your chances of winning each point are so large, more than 90%, the chances of losing a single point are small. So small, in fact, that losing a single point in the game is enough to swing the chances of the whole game against you. Not wholesale, obviously, since you're still overwhelmingly likely to win the game, but by some. Having two points is almost irrelevant - it's to be expected. So being 30:15 up in the game actually is a bad thing, because you've lost a point you were expected to win. 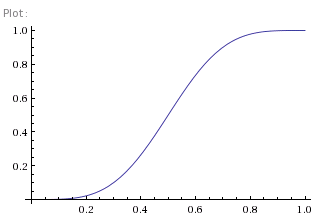 The cross-over happens at (1+√7)/4 which a shade over 91.1% as the graph shows. And that's the other slightly unexpected thing. If your chances of winning each point independently are less than 90%, the cross-over doesn't happen, because losing a point isn't sufficiently surprising. Which I find slightly surprising.